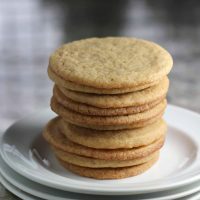 Maple cookies are an update sugar cookies with the deep flavor of maple syrup within each bite. 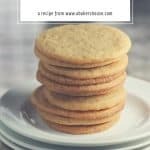 I’m sharing this maple cookie recipe and you’ll find these are “moreish”– it is nearly impossible to eat only one. Or two. Or three. You’ll want more! Stacked up like pancakes, this tower of maple syrup cookies offers a crispy bite and a homey maple syrup flavor that you’re sure to enjoy. 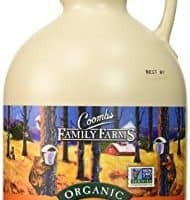 Maple syrup has a way of deepening flavor in baked goods. Try this maple apple crisp recipe which pairs maple syrup with apples– a perfect combo! Baking maple oatmeal bread is another way to enjoy that maple flavor! 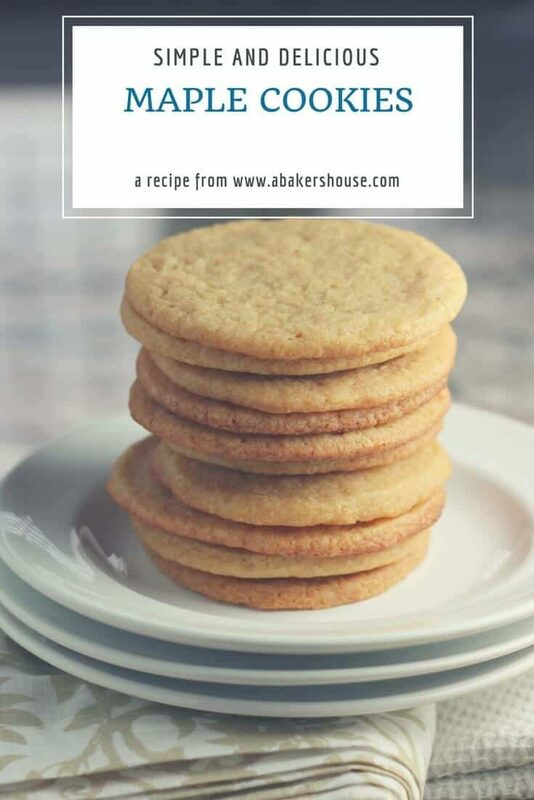 What ingredients are in this maple cookie recipe? How do you make maple cookies? Combine the flour and salt then set aside. In a separate large mixing bowl beat the butter and sugars until fluffy with an electric mixer. Add in the maple syrup and the egg. Beat until well combined. Refrigerate the dough for one hour. Roll out the dough and use cookie cutters to make maple leaf shapes OR make small balls of dough instead. Place on a parchment lined baking sheet and bake at 325 for 15 minutes. Cookie Shapes– leaves or circles? 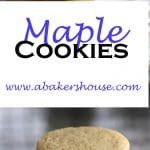 The original recipe from Martha Stewart called for these to be cut into maple leaf shapes but I found that even with taking time to chill the dough in between each step, the cookies spread quite a bit while baking. Circular shapes were an easy solution and they turned out nicely. Circles are a forgiving shape when it comes to cut-out cookies– honestly, if a small circle is good, isn’t a larger cookie even better? In my book, yes! It’s optional to brush the baked cookies with more maple syrup and top with a sprinkling of sugar which creates a sweet maple glaze. I thought they were sweet enough as is but give both a try. 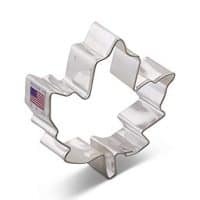 If you are celebrating Canada Day on July 1st, then of course, go ahead and make these maple leaf cookies using a maple leaf cookie cutter. Tag me on Instagram so I can see your creations @abakershouse. Why add an egg yolk to the cookies? You’ll notice that this recipe calls for an egg yolk rather than an entire egg. Why? The answer lies in the science of baking. Egg yolks tend to add moisture and chewiness to cookies. The fat in an egg resides in the yolk so baking with egg yolk lends a richness and flavor to the dough whether it is cookies or a cake. The baking concept is the same. Egg whites create structure (think of how an egg white based cookie like this macaron or a meringue has a stiff batter and the cookie holds its shape). Egg whites may also dry out a cookie– there is no moisture left in a baked meringue dessert like pavlova! So here we add the egg yolk and leave the egg white out to develop a chewy texture. The single egg yolk is likely what contributes to this cookie spreading a bit while baking. You could counterbalance that spreading by refrigerating or freezing the dough before baking. 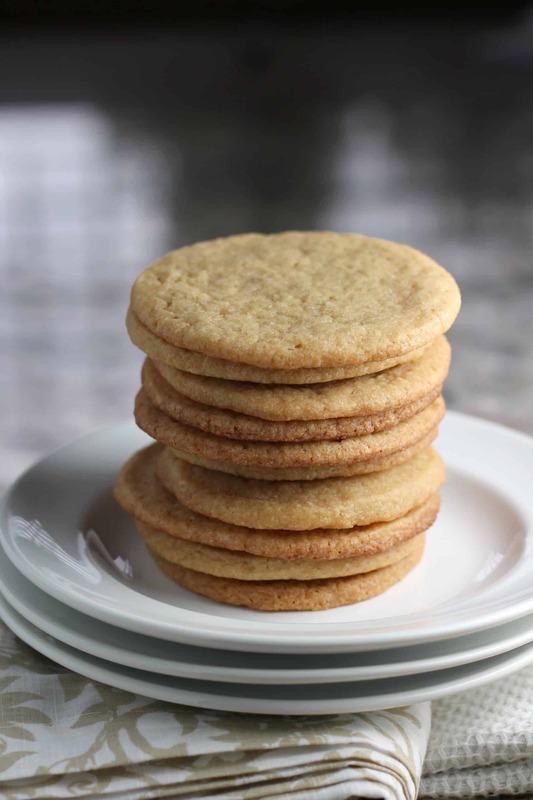 Maple cookies are a basic sugar cookie dressed up with maple flavors using maple syrup. Just enough of a twist to made them stand out. Baking with maple is great for the fall season or year round. Combine the flour and salt. Set aside. Beat the butter and both sugars together. Add the egg and maple syrup. Beat to combine. Fold in the dry ingredients. Form a ball of dough and refrigerate for one hour. Pinch off small bits (about a tablespoon each) and make balls. Roll in the sanding sugar then place on a baking sheet covered in parchment paper. Bake at 325 degrees F for 15 minutes. Original recipe found on Martha Stewart's site here. One of the best things about fall–in addition to sweaters and football–is all of the delightful seasonal themes that come to mind for baking: pumpkin, apples, late summer and early fall harvest, Halloween, Thanksgiving…. 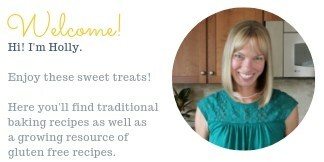 they are all fun and delicious to play around with, so check out what we have for you this month! Pumpkin Date Bars from What Smells So Good? I think round is perfect. I honestly think that Martha does that on purpose.. always doing it with more flair than we can. You showed her!! Love these! Mmmmmm! These look delicious! Definitely a fall cookie!